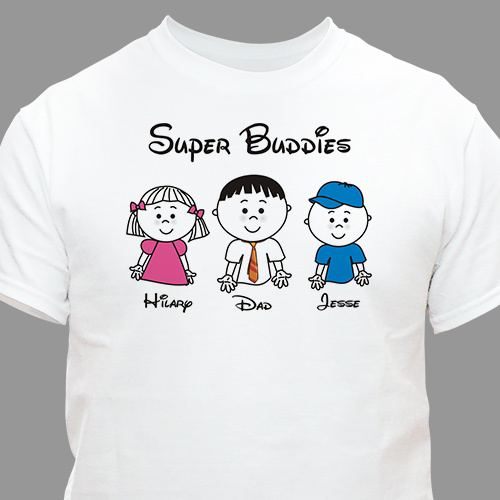 This Personalized Dad T-Shirt celebrates your kids which are the best buddies you could ever have. 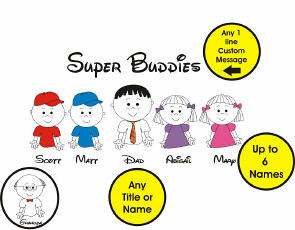 Show off your Super Buddies on one of these unique Personalized T-Shirts. Your Custom Printed Dad Shirt is Available on our premium white 100% cotton Personalized Shirt, machine washable in adult sizes S-4XL. Also available in Ash Gray. Includes FREE Personalization! Personalize your Dad T-Shirt with any 1 line custom message and up to 12 names. Please specify girl or boy, i.e. Jordan(b) and Dad or Grandpa. My husband loved his shirt and put it on as soon as he received it. I got this for my son and he will love it! These presents are perfect personalized gifts!